Mondays With Mary - Jill Ruth & Co.
Friday, I went down to our small town flower shop and bought some greenery and a few red carnations. Then my second daughter and I filled my collection of Mary vases. We like to pretend we know what we are doing...we had to arrange and rearrange many times! 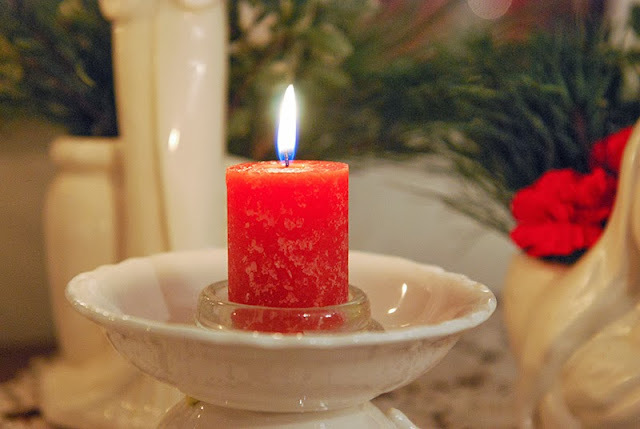 I swapped out the white candles with red in my coffee cup/saucer turned candle holders. Yesterday was the Feast Day of the Immaculate Conception and marked 11 years since my husband and I met which was also when the 8th of December fell on a Sunday. So this feast day is extra special to us. day 9 of her 12 days of Mary. 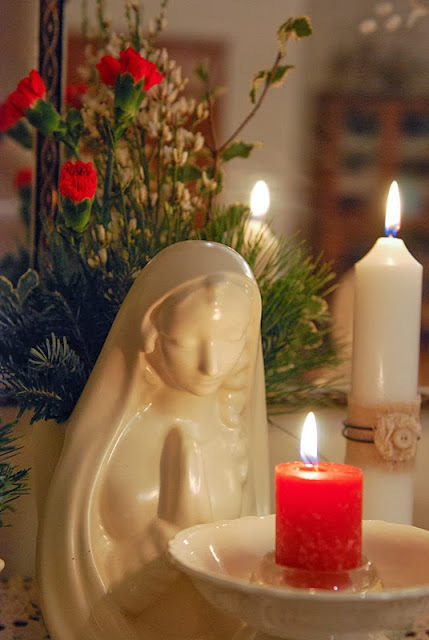 I hope this Advent time is full of joy for you! Jill, I'm really deeply moved by your Mary collection and the gorgeous antique they are all sitting on. 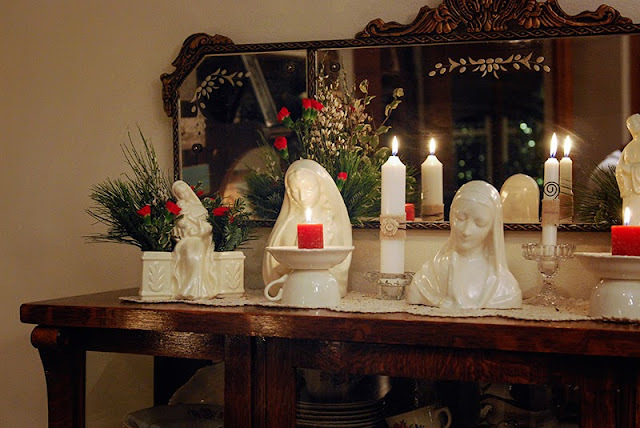 The contrast of the white vases and candle holders with the red and the greenery are dazzling. Where do you live? Anywhere in So Cal? I swear I'd drive there just to see your display in person. your all-white Mary collection is stunning! 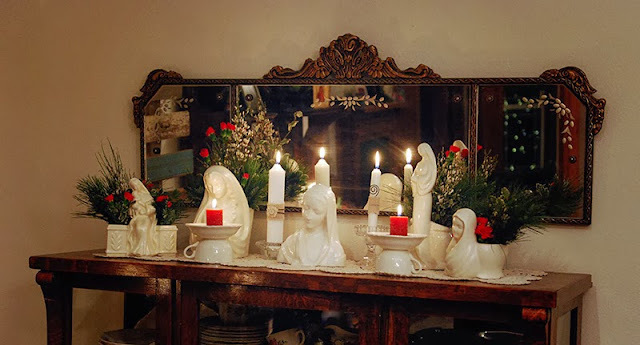 the greenery and red candles and red carnations set it off exquisitely. welcome to this meme! I admire your antique credenza! thank you for visiting me. BTW is Ruth your last name? Ruth is my middle name. Beautiful. White and red with lots of meaning. What a lovely collection of Mary you have! Thank you for stopping by and I hope we see you again! Beautiful. I think you and your daughter know exactly what you are doing. oh how throughly beautiful and how you have displayed your collection! i love the saucers turned candle holders, what a clever idea. 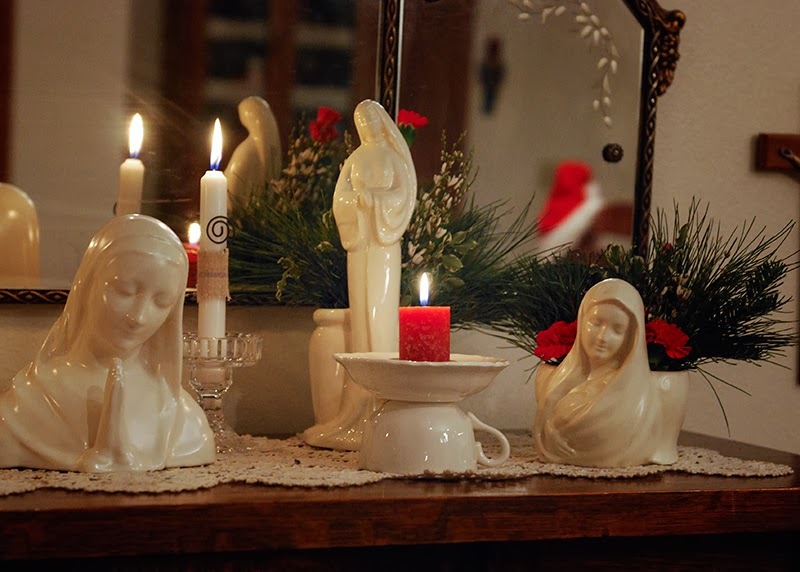 ♥ your Madonnas and how you have arranged them so beautifully!